Frenzy is a 1972 thriller film directed by Alfred Hitchcock, and is the penultimate feature film of his extensive career. The film is based upon the novel Goodbye Piccadilly, Farewell Leicester Square by Arthur La Bern, and was adapted for the screen by Anthony Shaffer. La Bern later expressed his dissatisfaction with Shaffer's adaptation. The film stars Jon Finch, Alec McCowen and Barry Foster and features Billie Whitelaw, Anna Massey, Barbara Leigh-Hunt, Bernard Cribbins and Vivien Merchant. The original music score was composed by Ron Goodwin. 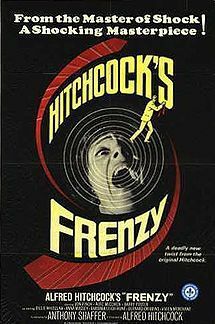 Frenzy was Hitchcock's first film to earn an R-rating in the United States, as Psycho was originally released unrated. The film was screened at the 1972 Cannes Film Festival, but wasn't entered into the main competition.